Subsidised South Korean ocean carrier Hyundai Merchant Marine (HMM) continued to bleed money in the final quarter of 2018, to end the year some Won808bn ($720m) in the red. It attributed the loss, which follows a $1.1bn deficit the previous year, to increased fuel costs, the Iran sanctions and “delay in rate recovery”. HMM transported 4.46m teu in the 12 months, which was 10.6% higher than the year before, as it stepped up its sales efforts. In a brief comment on its sector trading, HMM noted that its volume to the US had “increased due to the effects of the US-China trade conflict and the Chinese New Year holiday”. However, because of its aggressive drive to regain the market share it enjoyed before its financial restructuring in 2016, when its compatriot Hanjin Shipping entered bankruptcy, HMM’s revenue improved by only 3.9% to W5.2trn, resulting in the net loss. “Overall freight rates were weak due to a delay in regional rate recovery,” said HMM, citing “continuous competition” in the regional market. On the bottom line, HMM said it was “burdened” by fuel costs which were 32% higher than the previous year, with the carrier paying an average of $424 per tonne for its bunkers. HMM said that it would “continue its efforts to stably secure additional cargo to fill up the newly ordered 20 eco-friendly mega-containerships until delivery”. In October, HMM announced that the state-owned Korean Ocean Business Corporation (KOBC) had agreed to $5.4bn of new funding for the carrier. Underwritten by the KOBC funds, HMM placed a $2.6bn order with South Korean shipyards for 12 23,000 teu and eight 14,000 teu vessels, which will be delivered from the second quarter of 2020. The subsidy provoked a storm of protest from European and Japanese shipping associations, which accused the South Korean government of “unfair competitive distortions”. The arrival of the ULCVs next year will coincide with the expiry of HMM’s slot charter deal with the 2M Alliance on the Asia-North Europe tradelane, which, it is understood, will not be renewed. The Loadstar also understands that HMM executives have had several meetings with members of THE and Ocean alliances with a view to joining a VSA consortium from April 2020, but that so far no agreement has been reached. It seems likely that THE Alliance would be more interested in securing HMM’s membership for its ULCVs, given that the grouping is seen by the industry as being “underweight” in mega-ships. 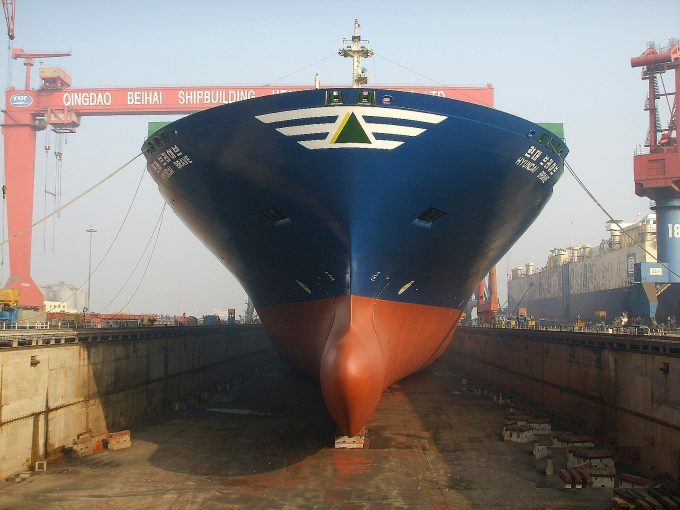 Moreover, the Ocean Alliance partners, CMA CGM, COSCO/OOCL and Evergreen, are receiving a staggering 460,000 teu of newbuild ULCVs this year, which has obliged them to launch a seventh Asia-North Europe loop from April. In April last year, HMM launched a weekly standalone Asia-North Europe loop deploying panamax containerships, and it is in the process of upsizing the vessels on the route to 6,300-6,800 teu ships. The service was initially seen as an insurance policy against its reliance on the 2M for its business, but in more recent months it is being promoted as the build up to the introduction of its new ULCVs. The Loadstar was told by a South Korean government source recently it had “learned its lesson” from the damage the Hanjin crash did to the reputation of the nation’s maritime industry, and the administration would do “whatever it takes” to get HMM back to being a major player. According to Alphaliner data, HMM’s capacity – including its orderbook – will increase from the current 424,742 teu to 820,742 teu by next year, possibly enabling it to leapfrog Taiwan’s Yang Ming to become the eighth-largest container carrier.